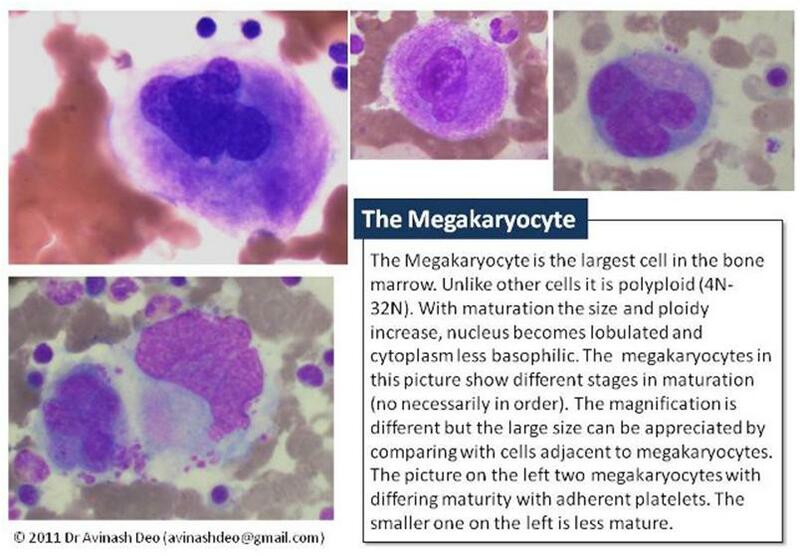 Megakaryocytes, the precursors of platelets, are the largest cells in the bone marrow. They are the earliest morphologically recognizable cells of the megakaryocyte-platelet lineage. Megakaryocytes arise from the stem cell via the megakaryocytic erythroid progenitors (MEPs), burst forming units – megakaryocytic (BFU-MK), colony forming unit megakaryocytic (CFU-MK) and the megakaryoblast. Megakaryoblasts are 10-20μm in size. They share morphological features with blasts of other lineages. Megakaryocytes from patients with acute megakaryocytic leukaemia may show pseudobleb formation. CD41 and CD61 mark the megakaryocytic lineage. Megakaryocytes are large cells (50-100μm) with a multilobed nucleus. They have been classified into three groups according to maturity. The boundaries between these groups are arbitrary and blurred. The most immature megakaryocytes have a strong basophilic granule free cytoplasm and high nuclear/cytoplasmic ratio. With intermediate maturation basophilia decreases, azurophilic granules appear cytoplasm and nuclear lobulation increases. The most mature megakaryocytes have a large amount of weakly basophilic cytoplasm with an abundance of azurophilic granules and polylobulated nucleus. Megakaryocytes, unlike other cells in the bone marrow, are polyploid (4N-32N). The 4N megakaryocytes are exclusively immature and 32N are dominantly mature. Polyploidy occurs because of endomitosis (DNA duplication without mitosis). Endomitosis is essential for normal platelet production but the mechanism of endomitosis in poorly understood. Thanks, it was really helpful…..